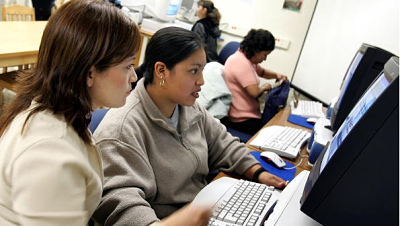 Education among the Latino community in America has become the top priority. As matter of fact, a Pew Research Study in 2014 showed that it is the No. 1 issue among Latinos, ranking even higher than healthcare and immigration in order of importance. The group's growth in public education and higher education has seen tremendous progress over the past decade. Latino dropout rates have declined and college enrollment has gone up, despite trailing in the numbers compared to other groups in regards to earning a bachelors degree. A 2014 National Journal poll indicates that most Latinos, approximately 66 percent, who got a job or went on to a career in the military after high school, did so because they needed to help support their family. By comparison, only 39 percent of whites have cited the same reason for doing the same thing after high school. These five facts about Latinos and education will help you better understand the group, according to Pew Research. 1. Since 1993, the number of Hispanics ages 18 - 24 enrolled in college has tripled. By comparison, in 1993, 728,000 Hispanics were enrolled in college. In 2013, 2.2 million were enrolled. There was also a 78 percent increase with African-Americans and a 14 percent increase with Whites. 2. The high school dropout rate has decreased dramatically. In 2000, the rate was at 32 percent. In 2013, that number dropped down to 14 percent. 3. More Latinos are getting post-secondary educations and four-year degree, at 15 percent among the age group 25 - 29. Although that number still lags behind other groups of the same age, it is improving. 4. But the reason the previous statistic is so low is because most are optioning for a public two-year degree instead. 5. Latinos are less likely to accrue student debt, with only 22 percent of those young households having to take out loans. That number is significantly higher among other groups in the nation.